BRISTOL – The Boys & Girls Club of Bristol Family Center received the two highest honors an individual and an organization are able to receive within a region, at the 2018 Northeast Leadership Conference of Boys & Girls Clubs of America in Baltimore. 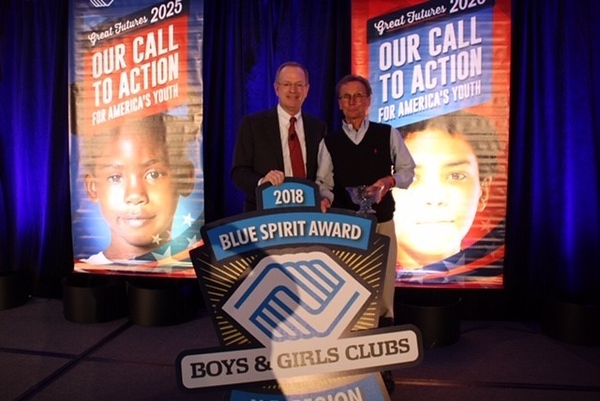 The conference commenced with Boys & Girls Clubs of America President, Jim Clark presenting the Blue Spirit Award to Michael Suchopar, President and CEO of the local club. The Blue Spirit Award is the highest honor bestowed by the President of BGCA to a local club professional in a region. The award recognizes an individual who demonstrates the mission of the club and goes above and beyond to drive impact and make a difference. There are approximately 4,300 Boys & Girls Clubs in America that are divided into five geographical regions. The Boys & Girls Club of Bristol Family Center has provided services to children and families in the Greater Bristol area for over 100 years. For more information on the Bristol Boys and Girls Club, located at 255 West St., call 860-583-4734 or visit bbgc.org. Posted in The Bristol Press, Bristol on Wednesday, 5 December 2018 19:53. Updated: Wednesday, 5 December 2018 19:55.